My daughter and I have been having a lot of fun with GoldieBlox – a line of toys created to help girls start building. If you are a parent, you know that most toys are very gender specific. Boys get to build and fight while girls get to play dress up and look pretty. Girls are lacking developmental toys and it’s very sad. 2014 should have more options for our little ones and GoldieBlox couldn’t agree more. We had the opportunity to test out a few games from the GoldieBlox line and had a BLAST. Natalie wanted NO HELP. She insisted that she build out these designs on her own. I sat back and filmed. The first game we tried out was Goldie Blox and The Movie Machine . I love the fact that each GoldieBlox game comes with some reading material and a backstory. So, it’s not just instructions and pieces. There’s life to this learning game! In the Movie Machine, your daughter will not only be able to build out the unit, but she will then have the ability to pass out movie tickets and pick which show she wants to show her friends. Fun stuff! The instructions are REALLY easy to follow and the pieces are color coded and the same throughout the entire GoldieBlox series. A cog in this box is the same color as a cog in the next. The more boxes you purchase, the more familiar you become with the way things work. Did I mention that you get a FREE IOS app that works with the toy?? SUPER! Here’s a video of Natalie putting together the GoldieBlox Movie Machine. 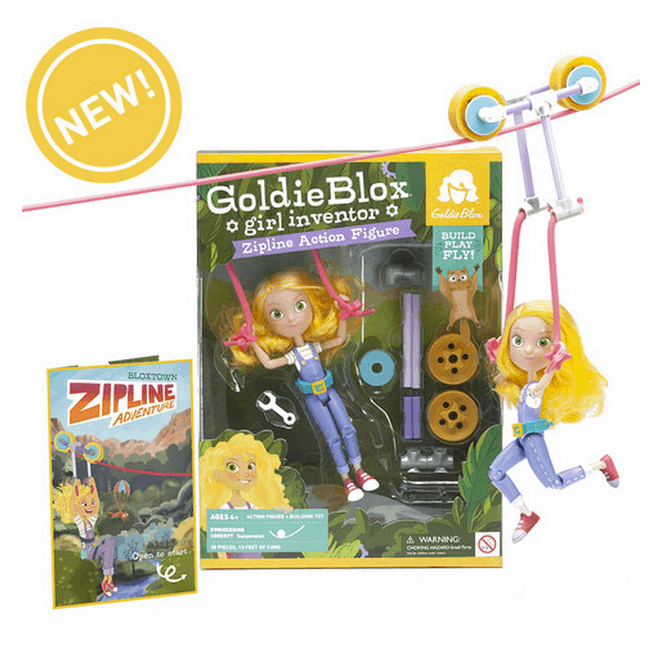 Next up we have the Goldie Blox Action Figure with Zipline . I highly recommend getting this action figure in conjunction with any other learning set you purchase. There’s something special about owning GoldieBlox as you are building out her designs. Of course, GoldieBlox is not just typical doll. There’s an adventure waiting for your little girl in this box as well. She zip lines!! This one was pretty easy to put together. We did have to help get the wires set up the first time because Natalie couldn’t get the suction cups to stick, but I think that’s because she was just too excited! It was an easy enough fix for us. We pressed hard and off Natalie and GoldieBlox went! Over and over and over again. Even her brother got in on the fun. Check out a video of Natalie putting together the GoldieBlox Zip Line Action Figure here. There are so many different options for you to choose from! Honestly, the holidays are right around the corner — if you have little girls in your life, consider getting her a GoldieBlox learning toy. And before you go, check out this brand new video from GoldieBlox – “GoldieBlox vs. the Big Sister Machine.” Big Sister prescribes her ideals of beauty and perfection to young girls. Little Sister – a girl inspired by Goldie – rebels against the mantra, breaking the girls free and leading them to a world of possibilities – all set to Metric’s “Help I’m Alive” hit. Let me count the number of ways I love this: #1) Natalie was so fascinated, she didn’t want your help, #2) a toy company/brand is targeting girls who love beyond pink/purple, princess and dolls #3) your girl was fully engaged, exploring, thinking and playing… I could go on. This is fabulous. 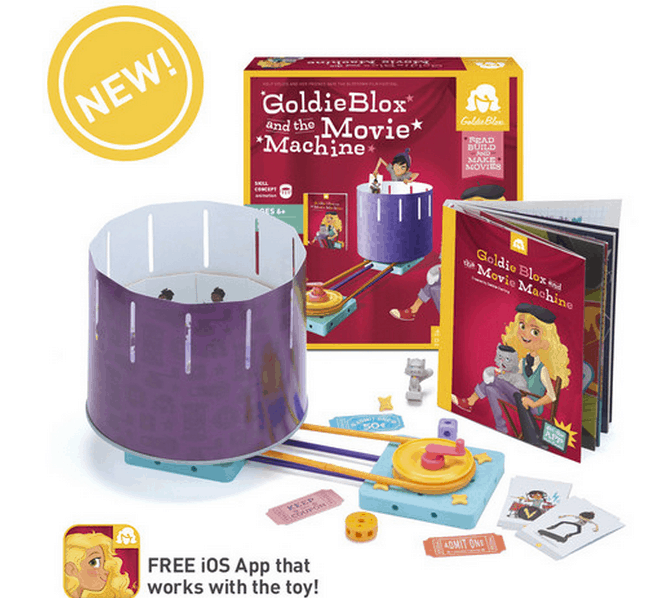 GoldieBlox is seriously on the TOP of my list for all the girls in my life this holiday, and it’s numero uno for birthday gifts for all of my girls’ friends. LOVE them. what a wonderful vehicle to encourage our girls’ to enjoy and engage in pursuits normally reserved for boys! I keep hearing about GoldieBlox. I really need to check it out. My older daughter loves to build and make things. I JUST heard about this recently! I love this!!! I’m going to tell my nieces about these. So awesome!! I love GoldieBlox – I’ve seen them a few times before. Love the mission behind them re: getting girls to build more! May have to get some for my nieces sometime soon. How neat! My kids would LOVE this! We are obsessed with GoldieBlox! Already have a set put aside for Christmas presents!